Excerpted from the book Opening the Door to Meditation by the Ven. Khenpo Rinpoches. A shrine is a special place to sit and meditate. Set up a shrine in a permanent place that is appropriate for you. The shrine table should be covered in maroon or golden fabric. On the back of the shrine place an image or statue of the Buddha on a small, elevated platform covered in a dark blue cloth. If you don’t have the space or your living situation doesn’t allow for more, you can simply use a candle. Be realistic and harmonious with those sharing your living space. 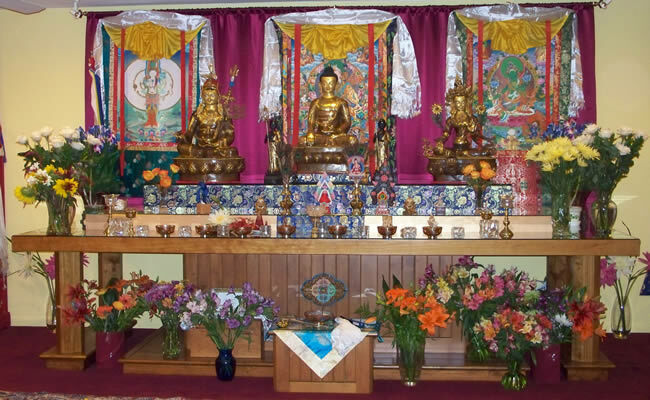 Your shrine symbolizes the enlightened universe of the Buddha and the true nature of your own mind, so with respect and mindfulness, always keep it clean and maintain a peaceful atmosphere around it. The most important part of your posture is to keep your spine straight, but not rigid. Feel strong and grounded, but also very open, flexible, and relaxed. The Teachings say, “Straight body, straight channels, straight winds, straight mind.” Straightening your body naturally aligns your subtle energy channels, which calms your wind energies, and in turn balances your mind. Your legs can be in full lotus, half lotus, or cross-legged. If this is too difficult, perhaps a kneeling bench will help. If none of these are comfortable, use a chair that allows you to have a straight back with your feet firmly on the floor. Your back should be straight but relaxed. Rest both hands on your knees, or place your hands in the “Equanimity Mudra” with your right hand on top of your left hand with thumbs lightly touching each other, held at your navel. Gently pull your belly slightly in. Hold your arms in the “Vulture Wing Position,” with your shoulders back, chest open, and elbows held slightly away from your body. Keep your neck straight, in line with your spine. Hold your head erect as though it was suspended by a string attached to the top of your head. Keep your chin slightly tucked in toward your chest. Your tongue touches the roof of your mouth. Breathe normally. Your eyes look down in front of you off the tip of your nose, with your eyelids semi-closed. It is very helpful to have a good cushion or seat. Sit on a cushion that has the right height and firmness for you. Higher cushions are better if you have tight legs, and your knees will be slightly lower than your hips, which will support the natural posture of your spine. If a cushion is not comfortable for you, try a kneeling bench or chair. It’s most important to have a straight spine. If sitting on the floor is so uncomfortable that it continually interferes with your meditation, use a chair. If you’re wearing pants, loosen the waistband for more relaxed breathing. Be gentle with your body. Feel the preciousness of this opportunity with great joy and appreciation. 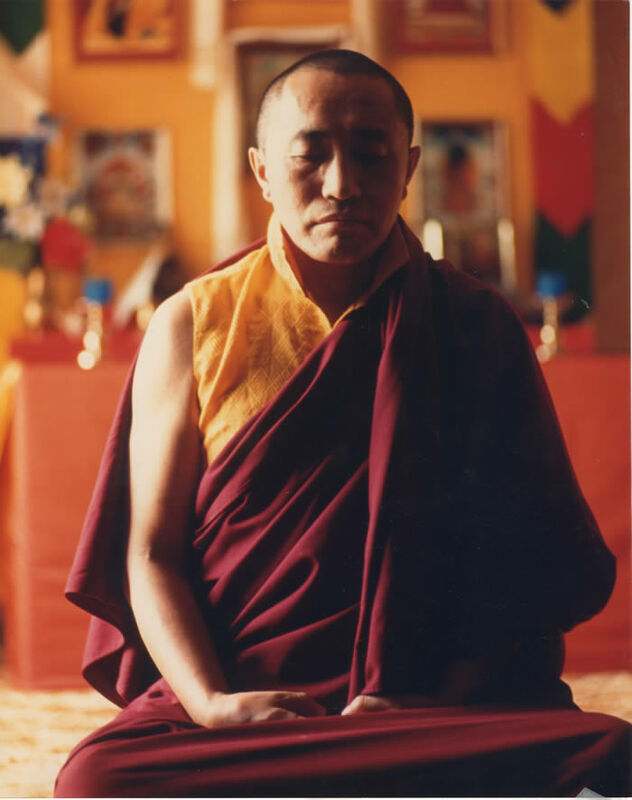 Courageously begin your meditation with a very uplifted state of mind that is filled with bodhichitta: the sincere wish to help all beings be free of suffering and attain enlightenment. After taking refuge in the buddhas and the enlightened nature of yourself and all beings, practice with mindfulness, joy, and appreciation, as well as compassion and kindness for everyone—including yourself. Create a peaceful atmosphere that does not disturb others. With a very uplifted motivation, begin the main part of your practice by calming your mind—focus on an object of meditation such as your breath. Be mindfully present as you breathe in and out. Thoughts will naturally arise, but gently yet firmly continue bringing your attention back to your breath. This practice consists in letting your mind rest attentively on the chosen object, and bringing it back to this object when you notice you have become distracted. Do this for as long as you have time. Next, while remaining present, relax your focus and rest in your natural state of mind without following thoughts about the past or future, calmly and peacefully abiding in the present moment with love, compassion, and wisdom. When you become distracted, without any questioning or judgment, bring your mind back to the present moment and again calmly rest there with joy. If you can, remain in that state for 10 to 20 minutes. Conclude with dedication prayers for the benefit of all beings. In post-meditation, see everything as a dream-like magical display, and feel great joy and appreciation. Maintain this feeling throughout your daily activities. “By this merit may all obtain omniscience. The mind thinks or feels something before everything we say and do. That’s why training the mind to be calm and clear will naturally affect everything else we do as well. Everyone needs a structured method to develop any ability. All structured methods are conditioned, contextual, and thus flexible depending on what’s helpful. To progress in anything, we must apply the method consistently & regularly. Meditation works in the same way. Why not try meditating for ten minutes every morning and see what happens?